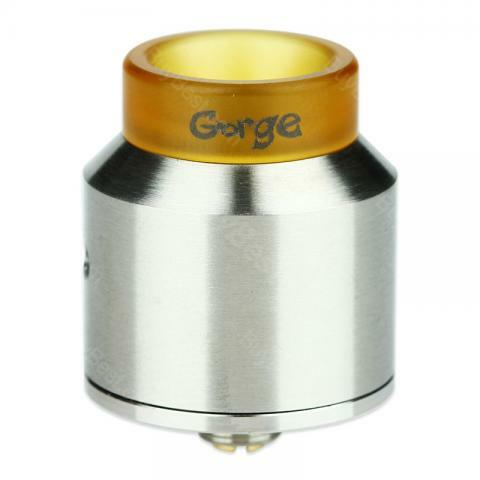 Advken Gorge RDA is rebuildable tank atomizer, it is a single coil RDA and 24mm diameter. Advken Gorge RDA is rebuildable tank atomizer, it is a single coil RDA and 24mm diameter. It has side dual-bevel airflow holes and a simple coil building design. The Gorge RDA perfect fit for squonk style mods. It comes with PEI sleeves and stainless steel, and you can replace it according to your preference. The Advken Gorge RDA will bring you the excellent vapinig experience. 2 colors for you to choose. • It's an empty cartomizer, you still need order e-juice e-liquids to use it. • Rebuildables are for experts, not for average or beginner vapers with no knowledge of how to rebuild atomizers. These materials cannot safely be used by the inexperienced or those without basic knowledge of electronics. • Only TPD Version is available. Muy buen rda para sabor, de los mejores que se pueden conseguir con precio low cost. Advken Gorge RDA is a very cheap and simple RDA, not bad flavor. Kommt Advken Gorge RDA mit ein paar Ersatzteilen welche man mit Sicherheit nicht bei vielen Anbietern erhält. Alles in allem ein Super Preis-/Leistungsverhältnis.